They say that the book about tasty and healthy food should consist of two distinct parts: the "delicious food" and "healthy food". But when you consider the availability of such products, such as green beans, then this can be easily debatable. This valuable product contains huge amounts of b vitamins and folic acid, while possessing excellent taste. And cook it is quite simple. 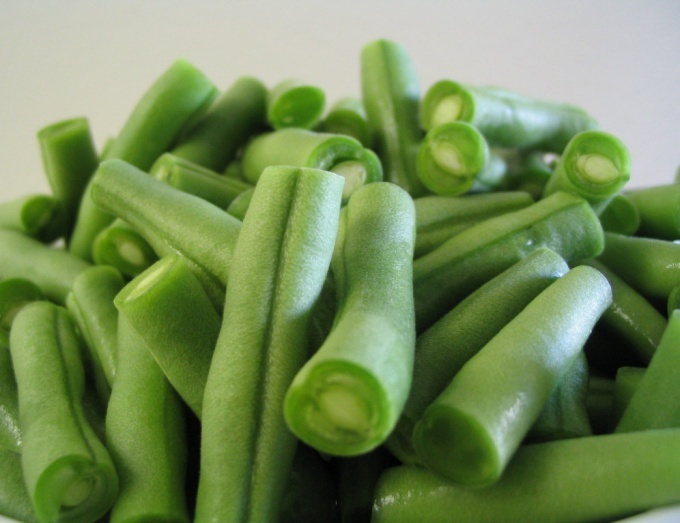 Take young green string beans, rinse thoroughly under running water, cut into small pieces. Tomatoes scald with boiling water and remove the skin and cut into small pieces. Fresh tomatoes in this recipe to replace canned. Garlic pass through a garlic press and mix with tomatoes. All this mixture pour in the chopped green beans. Take a saucepan or deep pan with cover, patina oil and put on fire. Finely chop onion, add to heated oil and fry at low power heat until Golden brown. Add to fried onions mix green beans and tomatoes. Bring the mixture to a boil over high heat, then reduce the fire to minimum and simmer until cooked about 20-30 minutes. Unfortunately, the vegetation period of green beans is not long. But this situation is a good way - it can be frozen. And it will not lose its beneficial properties. Chopped beans scald with boiling water (this is necessary to ensure that in the process of freezing she didn't become bitter). Lay the blanched pods on the grate in order to keep the water glass full. Bean pieces, from which the water glass, remove the grid, put it into a bag and place in the freezer.